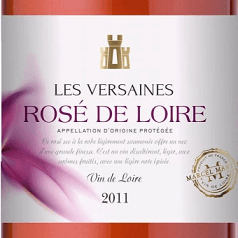 Rose de Loire les Versaines 6 bottle case a pink dry wine made ​​from grapes grown in the area of Nueil sur Layon, south of the Loire. The terroir is both dominated by the Angevin shale and clay and limestone Saumur (tufa). Harvest reasoned culture framed by the standard "Terra Vitis" yields 60 hl / hectare. Harvested at full maturity. Rosé wine obtained by "bleeding" (juice obtained after short maceration). Fermentation at low temperature for a better expression of natural flavorings. Odour On the nose and palate, it offers a bouquet of ripe fruit (cassis, cherry, cherry-currant, strawberry ...). Flavor Light, refreshing, it's a cool, dry wine, both soft and flowing. Wine & Food Passe-Partout: Accompany a variety of dishes. As an aperitif, it is the simple dishes favorite companion, accompanying wonderfully all the dishes that make the charm of the summer kitchen and outdoor: charcuterie, creative salads, tabbouleh with mint, poultry.